In a post-apocalyptic world, giant cities on wheels consume all in their path. For some odd reason, Australia has cornered the market in prestige cover bands, with the likes of The Australian Pink Floyd, Zep Boys and Bjorn Again making a living from imitating musical legends and playing to packed houses over the last couple of decades. Perhaps inspired by their neighbours' (everybody needs good neighbours) success, New Zealand has given us its own blockbusting tribute act, Mortal Engines. Frontman director Christian Rivers and his rhythm section of screenwriters Philippa Boyens, Peter Jackson and Fran Walsh (formerly of folk outfit Gandalf and the Hobbits) promise audiences a note for note recreation of the experience of seeing the original Star Wars trilogy in cinemas. They play all the hits - 'I am your father', 'The handsome black man who lives in a city in the clouds', 'Duelling sabers' and of course, the bombastic closing number 'Plucky pilots take down a massive structure by flying into a chasm and hitting its weak spot'. If smoking were permitted in the cinema you'd believe it was 1977 again! Not since 1982's notorious knockoff, Turkish Star Wars, has a movie so flagrantly ripped off George Lucas's creation. Practically every plot point in this adaptation of Philip Reeve's YA fantasy novel is 'borrowed' from the first couple of instalments of Lucas's saga, with the occasional nods to Waterworld (a joke about drinking your own urine; the opening Universal logo co-opted to visualise an apocalyptic event) and the Mad Max series (composer Junkie XL delivers a soundtrack that might as well be outtakes from his Fury Road sessions). 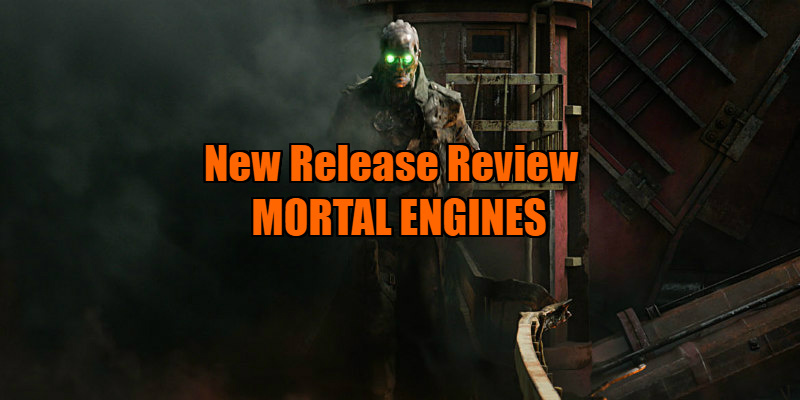 That's not to say Mortal Engines doesn't have an original idea in its head, as the central premise and its resulting imagery is like nothing you've seen before. A few millennia after earth is left in ruins by the '60 Minute War', the remaining population roam around in giant cities on wheels. The biggest of the lot is London, a behemoth that consumes any smaller towns and cities in its path, co-opting whatever resources they might offer. Determined to put an end to the former UK capital's reign is a young 'anti-tractionist', Hester Shaw (Hester Hilmar), who infiltrates the rolling metropolis, planning to kill shifty historian Thaddeus Valentine (Hugo Weaving). The idea of cities on wheels sounds like something that could only work on paper, but kudos to the FX and production design team for pulling it off here. Quite a bit of thought has gone into how such an idea should be portrayed, and the portable London is a clever bit of steampunk designs, the wheel of the London eye repurposed as a giant elevator to take citizens up and down levels and the dome of St. Paul's cathedral opening to reveal a missile system. There's a sense of scale to this film that's absent from many bigger budgeted productions, and while the script offers nothing remotely original, the film continually surprises with its visual inventiveness. On paper, Mortal Engines reads like a concept that could only result in a movie that's so bad it's ironically entertaining for that very reason, but the major flaw of this movie is that it's so self-conscious of its bonkers premise that it plays its drama far too seriously. It's refreshingly lacking in the brooding, emo atmosphere of its YA contemporaries, but it's also devoid of humour, and its cast are forced go through the motions and deliver stiff performances, spouting functional dialogue. None of the characters here are anything more than archetypes, save for - ironically - a 'Terminator meets the Tin Man' robot (voiced by Stephen Lang) who doesn't have a heart, yet comes off as more human than anyone else we meet. With South Korean star Jihae cast in a prominent role, a final set-piece set in an ambiguous Eastern metropolis on wheels and a notable absence of supernatural elements (there's a legion of Samurai type warriors who are basically Jedis without the magic), it's clear the filmmakers are hoping this plays well in Asia, which is where I foresee it taking the bulk of its receipts. 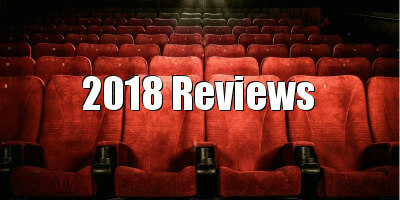 Western audiences have grown too snarky and cynical for the simple pleasures of old school romps like Mortal Engines, Skyscraper and Pacific Rim, but like the average Chinese cinemagoer, I'll take such innocent and unchallenging fare over the Star Wars and superhero snoozefests so currently beloved by Johnny Westerner. 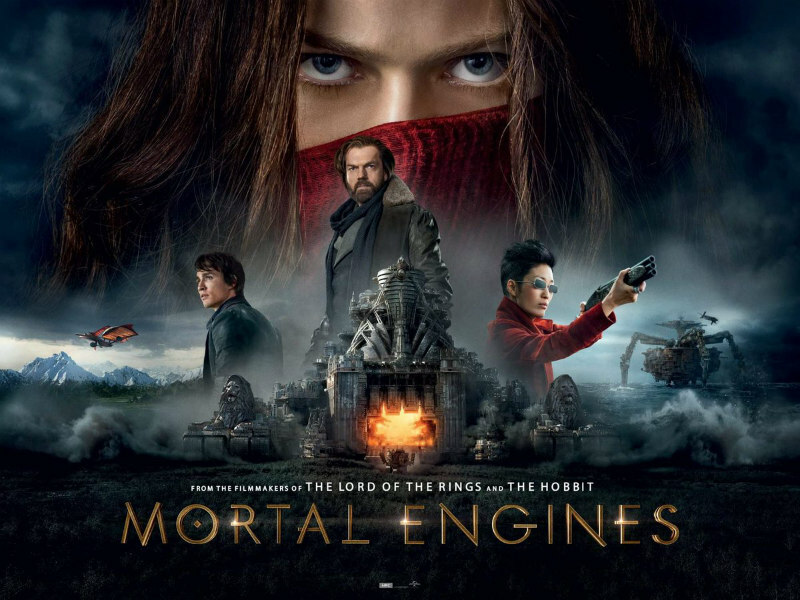 Mortal Engines is in UK/ROI cinemas December 8th.